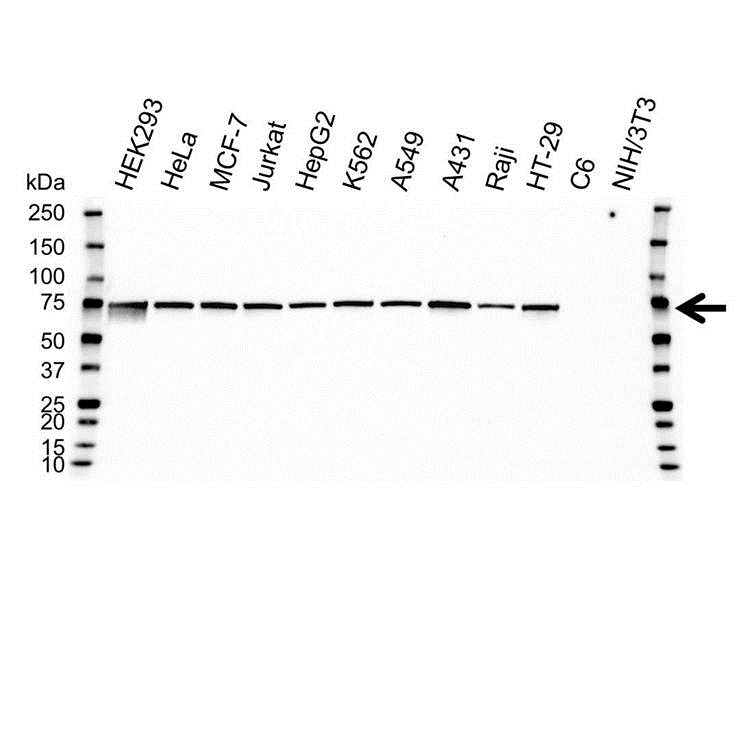 Heat shock protein 70 antibody recognizes heat shock 70 kDa protein 1A/1B, also known as heat shock 70 kDa protein 1/2, HSP70-1/HSP70-2 or HSP70.1/HSP70.2. The antibody has been extensively validated for western blotting using whole cell lysates. Mouse anti Human heat shock protein 70 antibody recognizes human heat shock protein 70 (HSP70), also known as heat shock 70 kDa protein 1A/1B, a 641 amino acid member of the HSP70 family espressed in the cytoplasm, which range in size from 66-78 kDa. Heat shock proteins are a group of heat- or stress-inducible proteins which act as molecular chaperones and as essential regulators of cellular processes, including protein folding. HSP70 acts alongside other chaperones to mediate the folding of newly-synthesized peptide sequences, stabilize proteins against aggregation and assist in protein transmembrane transport. Mouse anti Human heat shock protein 70 antibody recognizes human HSP70 as a single band of ~70 kDa in multiple human cell line lysates. Anti heat shock protein 70 antibody detects a band of approximately 70 kDa in HeLa cell lysates.